These units offer filtration systems that handle finite quantities of non-explosive solids, liquids, fumes, gases and nanoparticles. Additionally, our Ductless Fume Hoods with HEPA exhaust filtration also function as Class I BSCs (Biological Safety Cabinets). 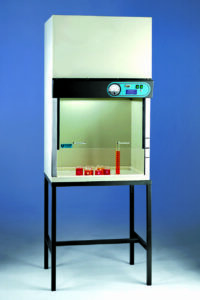 Conventional fume hoods are ducted to the outdoors. However, in certain existing facilities, adding a fume hood presents complex engineering challenges. In these cases, ducting to the outdoors is impractical or would require costly renovations to the facility’s HVAC system. Conventional ducting requires the installation of an exhaust air duct and blower system as well as any needed augmentation to the conditioned air systems. Germfree’s Ductless Fume Hoods utilize a multi-stage filtration system that captures a diverse range of airborne contaminants from the work area and returns purified air into the room. The unit is set up with the properly configured combination of filtration modules for your application. Aerosols, dust and nanoparticles are removed with a combination of prefilters, HEPA filters and ULPA filters. Fumes and gases are removed with a two-stage Carbon Composite Module. Each module is supplied with the designated combinations of adsorptive, chemisorptive and reactive agents required for your application. The carbon filter life is determined by the selection and quantities of the adsorptive and chemisorptive materials used in relation to the quantities and concentrations of the chemicals to be adsorbed in your application. The adsorption properties/capabilities of carbon are well established allowing approximate filter life to be determined prior to operation. The Carbon Composite Module can also be monitored during use and Germfree will help you determine the proper selection of gas monitors. Germfree’s Ductless Fume Hoods are designed and engineered to handle the rigorous demands of your application. The interior and exterior of our Ductless Fume Hoods are coated for resistance to chemicals. Additionally, we offer an all stainless steel model. Germfree is a leading manufacturer of mobile laboratories. We have installed our Ductless Fume Hoods into various truck and trailer based platforms. Our Ductless Fume Hoods are field-tested making them suitable for the most demanding environments. Germfree is the only company with global experience in installing ruggedized mobile biosafety cabinetry. This insures that your Ductless Fume Hoods can be deployed wherever they are needed. Additionally, Germfree products utilizing HEPA, ULPA and carbon air filtration are designed for ease of performance testing and certification when required.